On paper, the cameras on all four phones are identical - 8MP stills, 1080p video, a single-LED flash and no shutter key. If you dig a little deeper though, you'll start noticing differences. Stuff like burst shot, taking photos while recording video and so on might not be essential to your photography needs, but they could come in handy at times. Here's a table that shows what each of the contenders has to offer. We've covered these features in each smartphone's review, so we'll just go over them quickly. Here it's more important to note the differences between the implementations of the same feature on the four phones. Touch focus lets you refocus a shot on a particular object. All besides the Optimus 4X HD let you do that even while recording video. The LG Optimus 4X HD and the Meizu MX 4-core try to make up for the lack of a hardware shutter key by letting you use the volume rocker instead, but the rockers aren't all that comfortable and they can't be half-pressed for activating auto-focus. Burst mode shoots several photos in quick succession - the Meizu MX 4-core always snaps 5, while the others continue shooting while you have the shutter key pressed. The Samsung Galaxy S III is limited to a maximum of 20 to prevent you from accidentally filling up the memory with identical shots. An option in burst shot mode is Best photo, which snaps 8 photos and picks the best one automatically. The HTC One X also imposes a 20 shots max by default, but you can remove that restriction. The LG Optimus 4X HD takes about a second between each shot, while the other three manage multiple shots per second. Group shot is unique to the HTC One X - it snaps 5 photos and for each face in the shot lets you pick which photo should be used, making it easy to adjust things so that everyone is smiling and nobody is blinking. We've seen a dedicated Scalado app do that as well as Huawei Ascend P1's native camera, but the other three phones in this comparison can't do it out of the box. We've already covered Best photo, but the Samsung Galaxy S III also offers Buddy photo share - it recognizes your friends' faces and automatically tags them. The LG Optimus 4X HD boasts a time-bending feature called Time catch shot - it actually takes photos before you press the shutter key, so when you do press it, you can pick from 5 shots taken around the time of pressing the key. This increases your chances of catching just the right moment. Another cool feature of the 4X HD is real-time video effects - it can either morph people's faces in funny ways or do a sort of poor man's green screen effect and replace the background with something more interesting (e.g. space). The Meizu MX 4-core doesn't have HDR mode, it relies on Wide Dynamic Mode instead, which snaps only a single photo and isn't a match for HDR (which combines information from multiple shots). The Gesture shot lets you snap a photo by waving your hand in front of the proximity sensor - this way you can completely eliminate camera shake created by pressing the shutter key (yes, even the virtual one on the screen can cause some shake). Each camera has a few flashy features to offer, but none of that will mater if they can't pass muster in terms of image quality. We snapped four photos with each phone in the same lighting conditions (you can view the full resolution shots below) and we've prepared two 100% crops from two of these photos to highlight the difference in image quality. We'll also take a look at what our Photo Quality Comparison tool shows. Let's start with the first crop. The Samsung Galaxy S III produces the sharpest photos of the four phones. Colors are mostly accurate though the greens are a bit off. The HTC One X is behind in terms of sharpness, despite the overly aggressive sharpening. The contrast is set too high and colors off. . The LG Optimus 4X HD comes pretty close to the Galaxy S III - the aggressive noise reduction has eradicated quite some detail in the foliage, but the colors are probably the best in its shot. The Meizu MX 4-core produces photos with low-contrast, making them look washed out (the under-saturated colors don't help). The shadows are well-developed and the sharpness of the photos is pretty close to the One X. Moving on to the next crop, the Galaxy S III still has some lead in terms of sharpness, but the Optimus 4X HD and Meizu MX 4-core come pretty close. It's only the HTC One X that is noticeably lagging behind. The Samsung flagship is off when it comes to colors though - the yellow doesn't look right, possibly due to S III's tendency to boost the green channel. 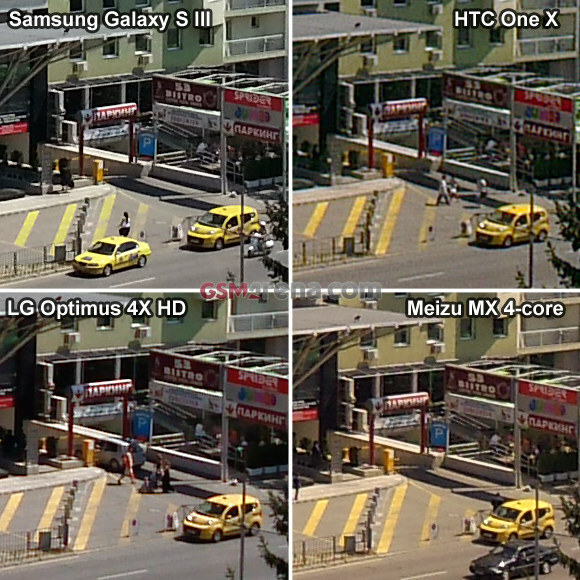 The MX 4-core is off too, but that's due to the yellowish color balance it had selected. Once again the colors on the Optimus 4X HD photo look the best here, with the One X colors being in the right neighborhood (but oversaturated as usual). Here's a comparison of the field of view captured by each camera. 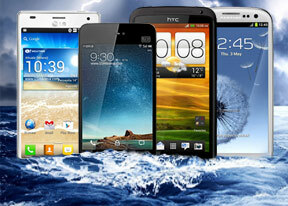 The HTC One X has the widest viewing angle, with the Meizu MX 4-core and the Samsung Galaxy S III snapping only a little less. The LG Optimus 4X has a noticeably narrower field of view. 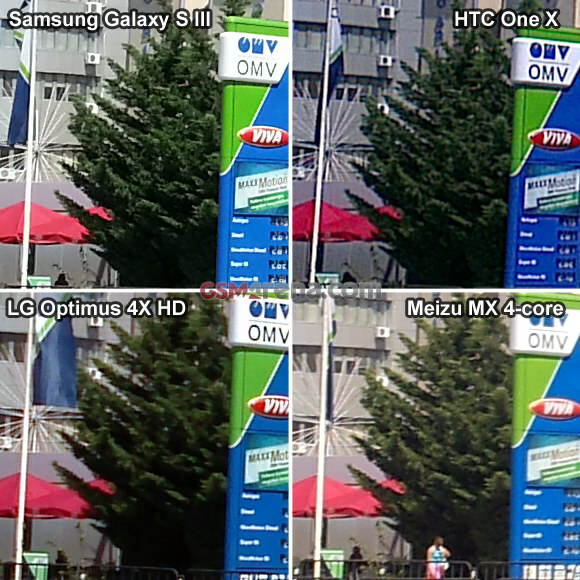 Looking to our Photo Quality Compare tool, it shows that the Samsung Galaxy S III offers the best horizontal and vertical resolution of the four, with the LG Optimus 4X HD coming breathing down its neck. 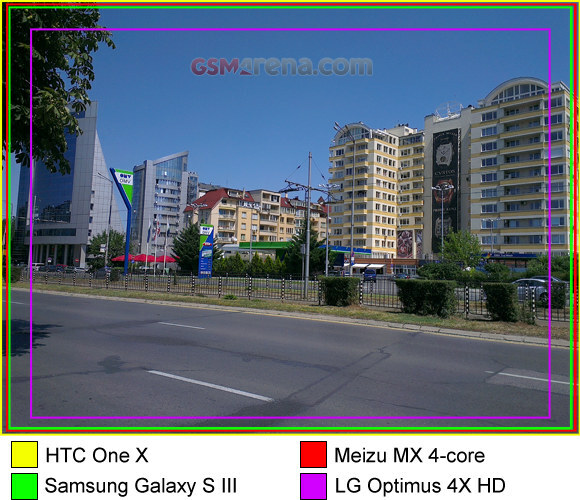 The HTC One X lags behind despite the fact that the nature of the charts benefits the heavy sharpening in its processing and the Meizu MX 4-core produces soft photos with horizontal and vertical lines starting to blend pretty early. The next chart shows low levels for the Galaxy S III with the Optimus 4X HD coming close again (but there are hints of color noise in its photos). The noise reduction algorithm is more aggressive on the LG and the lines between the color squares are not as clearly defined as on the Samsung. A good deal of sharpened noise is visible in the HTC One X photos, while the Meizu photos have fairly low amounts of noise and the noise reduction doesn't take too much away from the grass and gravel patches (unlike the HTC). Finally, the third chart shows good white balance under artificial lighting from the Samsung Galaxy S III and the HTC One X, while photos from the LG Optimus 4X HD have a noticeable blue tint. The worst offender in this regard though is the Meizu MX 4-core with a heavy blue tint. Surprisingly, the HTC One X eked out more detail than the Optimus 4X HD and even the Galaxy S III, two phones that bested it thus far. Color issues aside, the Meizu MX 4-core holds its own against the 4X HD. Overall, we'd call the Samsung Galaxy S III the winner here, with a slight advantage over the LG Optimus 4X HD. The HTC One X overprocesses shots and we found the results lacking, though it does have the widest FoV and it performs well under unfavorable lighting thanks to that bright F/2.0 aperture. The Meizu MX 4-core has potential but the software needs more tweaking and our unit had a lens issue.